Catholic Daughters of the Americas . . .
is one of the oldest and largest organizations of Catholic women in the Americas. numbers 75,000 dues-paying members in 1,250 courts (local chapters) in 45 states across the country, and in Puerto Rico, Mexico, the Dominican Republic, Guam, and the Virgin Islands. includes concerns of today’s church and society as well as issues that affect the well-being of women and children. Members of the Catholic Daughters . . .
share faith, love of God and a distinctly feminine spirituality alluded to by Pope John Paul II when he spoke of the necessity of “feminine genius” in today’s world. enjoy each other’s company at meetings and work hard for their parishes and communities. CDA gives us the ability to answer God’s call to service. As you may know from our old Baltimore Catechism days (if you are very young, this may be before your time), we were created to know, to love, and to serve God. CDA retreats, days of recollection, corporate Communions, and private and collective prayer, all help us to come to know God so that our love for Him grows. It is that love of God that calls us to service. The fact that we belong to a CDA court then allows us to use our gifts to answer that call to service. As court members, we live out the corporal and spiritual works of mercy by praying for and taking care of God’s people. When we feed the hungry, build Habitat Houses, visit the sick, pray for those in need, teach children, support our clergy, all of that is part of living a life of service. Even when we raise money, we are serving. Where will the money for our seminarians come from? How will we buy rosaries so that we can teach children to pray? How will the local women’s shelter get money for school supplies or clothing for battered women? Some of it will come from our bake sales and Christmas raffles, and chicken dinners. Even when we raise money, we serve and answer God’s call. In the end, we become CDA and CDA becomes who we are. We live out our lives praying and serving God’s people, and when the time comes, it is our CDA sisters who will be there to pray for us as we pass from this life into the next. 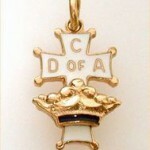 The Catholic Daughters of the Americas (CDA) was founded in Utica, New York in 1903 by John E. Carberry and several other Knights of Columbus as a charitable, benevolent and patriotic sorority for Catholic ladies. It was originally called the National order of Daughters of Isabella,” and is dedicated to the principles of “Unity and Charity,” the order’s motto. They were originally called the national order of the Daughters of Isabella, and Carberry served as the first Supreme Regent. The Knights established our two standards of Unity and Charity. CDA had 90 courts by 1908, and had grown from a membership of less than 100 to more than 10,000. The membership encompassed 69 cities in 18 different states. In March of 1913, the Daughters of Isabella purchased a building in Utica belonging to the Knights of Columbus for use as its official headquarters. The Daughters became very involved in overseas duty during World War I. They acted as nurses, did clerical work, conducted sewing and knitting classes for the Red Cross, and staged parties to entertain the servicemen. They also helped the Knights of Columbus raise $3 million for recreational activities for the enlisted men. When the war ended, Supreme Regent Genevieve Walsh was named to the newly formed national Catholic War Council. The CDA was a part of the restoration of the University of Louvain’s ravaged library in Belgium. It was also during this time that a youth society called “War Service Plan for Girls” was formed. This group later evolved into the Junior Catholic Daughters. At a biennial convention in 1921, the order changed its name from the Daughters of Isabella to the Catholic Daughters of America (CDA). In 1925 the first court outside of the United States was established in Cuba. It was during this time that the Knights of Columbus severed its ties with CDA, allowing it to become an independent organization. In 1926, the national headquarters moved from Utica to its current location at 10 West 71 Street in New York City. By 1928, the membership of the CDA had swelled to 170,000 members in courts that spanned 45 states, Panama, Puerto Rico, Cuba, and Canada.